East Woods School is a non-sectarian day school for boys and girls in grades Pre-Nursery through Eight. It received its charter from the State of New York in 1951 and was accredited by the New York State Association of Independent Schools in 1971. The school holds membership in the National Association of Independent Schools as well as in the New York State Association of Independent Schools. Located on the north shore of Long Island some thirty miles east of New York City, the school draws its students primarily from Oyster Bay, Cold Spring Harbor, Syosset and Huntington Townships, but now enrolls students from more than 15 school districts. The current student-faculty ratio is approximately 7 to 1. East Woods was founded in 1946 in Cold Spring Harbor by a group of interested parents who became the first Board of Trustees. During the school’s first year of operation, when it was located in a house in the West Hills section of Cold Spring Harbor, it was headed by Mr. Howard Corning, and it was under the supervision of Green Vale School. In 1947, East Woods became fully independent, and Mr. Buell Critchlow was appointed Headmaster. The following year, the enrollment grew to eighty-four students in nursery through grade four, and the school sought a new and permanent home. In 1948, the school moved to its present site in Oyster Bay Cove, a handsome Georgian brick home situated on 46 acres of land. The central school building and grounds were originally the mansion residence of Mr. and Mrs. Walter Farwell. Situated on one of Long Island’s highest hilltops, “Baywood” (later “Mallow”) had a commanding view of the then sparsely wooded area. Still now, the nighttime Connecticut shoreline is visible from the third floor parapet. A curving driveway leading from Northern Boulevard originally provided access to the property. As the driveway neared the house, it straightened, affording visitors the first view of the 1918 Georgian English architecture. Copied from eighteenth century models, “Baywood” was designed by William W. Bosworth, an architect who gained fame through his design of MIT’s Cambridge campus and restoration of the Palace of Versailles. 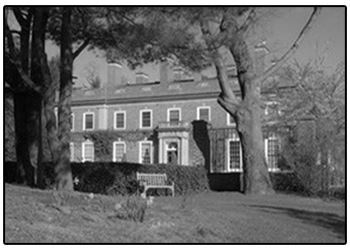 In the late 1940’s, George Cushing purchased the house in hopes of reselling it to the Duke and Duchess of Windsor. Because they declined it and because no other buyers appeared, some land along with the contents and appointments of the house were auctioned. These changes brought interest from two prospective buyers: the Russian government and an organization of Cold Spring Harbor parents. In 1948, this latter group purchased the property as the new location of East Woods School. Mr. Langdon G. Rankin succeeded Mr. Critchlow as Headmaster in 1953. At this point, construction of the dining room and gymnasium was underway and the school’s enrollment had grown to 232 students in preschool through ninth grade. In this same period, through the generosity of two families connected to the school who donated property, the campus doubled in size to approximately thirty acres. Another building program in the mid-1950’s brought the addition of more classrooms, an art studio and athletic locker rooms. Mr. William C. Brengle was appointed Assistant Headmaster in 1966 and became Headmaster the following year upon Mr. Rankin’s retirement. Another major building project in the early 1970’s included an addition to the library and the construction of the preschool wing. The school’s enrollment, which had reached 300 in the mid-1960’s, slipped to less than 200 students by the mid-1970’s but gradually recovered to approximately 210 students. Mr. James F. Adams succeeded Mr. Brengle in 1973. A wing containing a music center and two classrooms was completed in early 1988. Mr. James C. Ferrer became East Woods’ fifth Headmaster in 1990. A second gymnasium and a technology center were constructed in 1997. Dr. Nathaniel Peirce became East Woods’ sixth Headmaster in 2002. In 2009, a separate upper school academic building was constructed and renovations included a science center and expanded art studio. In the summer of 2012, further renovations were completed to create a performing arts studio. Mr. Matthew H. Bradley became East Woods’ seventh Head of School in 2013. Mrs. Laura Kang joined East Woods as the eighth Head of School in 2017.